Grief as wife to former DC murdered in cold blood in Eldoret is laid to rest in Baringo Central – Kenyatta University TV (KUTV). All Rights Reserved. 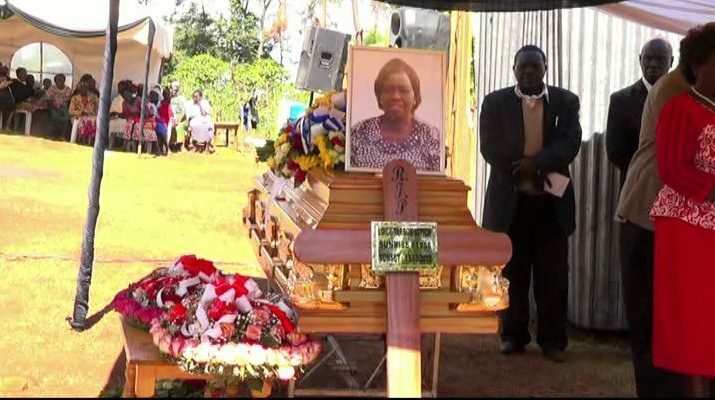 Grief engulfed the village of Choge in Talai, Baringo Central when wife to former Kakamega District Commissioner Paul Yatich, Loice Yatich was laid to rest. Loice was murdered in cold blood. This happens after the burial ceremony which had been scheduled for 24th October was postponed following a court order. MS Yatich badly mutilated body was found inside her house in Kiplombe on 13th October after going missing for three days in what police suspect to have been commited by a farm worker. On Sunday at around 11am her car was spotted in Kabiyet when it was discovered that it had been stolen and that’s when efforts to try to find her began. The fateful reality dawned on everyone when she was not found in all possible locations she was thought to be. After a long search which included tracking of her phone, police were forced to break into her house and that was when her deeply cut body was found lying in a pool of blood inside her room. The Kapropita Girls Alumni, worked as Curriculum Support Development Officer in Uasin Gishu county and she has also worked in Sergoit and Kaptagat zone where she served until her demise. The farmworker Boniface Kiptoo ,a prime suspect, is said to have tricked neighbours that Loice had gone to Nairobi for a seminar but a suspicious neighbour reported her disappearance to the police who later followed up the case. Three suspects linked to the murder have been arrested so far including the farmworker who is the lead suspect who was nabbed one week later in Naivasha. The family lauded efforts made by security officers to apprehend the culprits. However, they called upon them, to deliver justice in good time. MS Yatich who was born in the year 1956 leaves behind seven children and several grandchildren. She was eulogised by her children as a loving mother who always guided them and offered solutions to every problem.